Cancer treatments, including chemotherapy, often leave women sterile. In Italy, a woman was given the chance to conceive and give birth naturally via ovarian tissue grafting. The patient was treated with chemotherapy and bone marrow transplant for thalassemia. The condition resolved well, but precocious ovarian failure resulted. Before treatment, a small piece of ovarian cortical tissue was removed and cryopreserved prior to treatment. The patient was 21 years when treated. 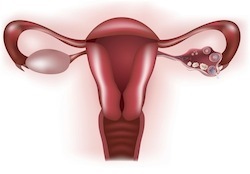 Eight years later the ovarian tissue was thawed and grafted at the orthotopic site. After three months, levels of follicle-stimulating hormone fell and estrogen (2) levels increased. The patient experienced several ovulation cycles before conceiving naturally 16 months after the graft. The patient carried the pregnancy 39 weeks. The baby was healthy with no remarkable side effects. Conclusion: With proper preparation and cryopreservation of ovarian tissue some women treated for cancer and other disorders requiring chemotherapy and/or radiation, reproductive ability may be restored resulting in successful, uneventful, live birth. Source: Revelli A, Marchino G, Dolfin E, Molinari E, Delle Piane L, Salvagno F, Benedetto C. Live birth after orthotopic grafting of autologous cryopreserved ovarian tissue and spontaneous conception in Italy. Fertil Steril. 2012 Oct 23. pii: S0015-0282(12)02248-0. doi: 10.1016/j.fertnstert.2012.09.029.